Note: About the PS setting and Xbox issues. Before apply the headset on your PS4, please test it with your cellphone to ensure it function well. PS4 setting: Insert the headset own 3.5mm jack plug into the Gamepad, then long press the PS button or enter the system Settings, there is a peripheral machines, choose "Adjust Sound and Devices", "output to the headphones", then change it to "all audio ". It is suitable for PS4,mobile phones,tablets, laptops(with 3.5mm combo headphone/microphone port). Xbox Issue: Before buying the headset for the Xbox using, make sure that your Xbox was the newest type products which has the 4 pin type port. Thus you can connect with the adapter cable in the package. If was the 3pin port, then you need to buy a adapter cable or the box to use it. DLAND gaming headset is a high performance one among headset of this price. lightweight design, no burden, offer you comfortable gaming experience for hours play. 3 pin 3.5mm plug, Simple but cool appearance, definitely a good choice for primary player. Note: Adjust headphones sound to the proper volume. Too loud sound would strain your ears. 1* Two in One 3.5mm 4 Pin Jack Cable. 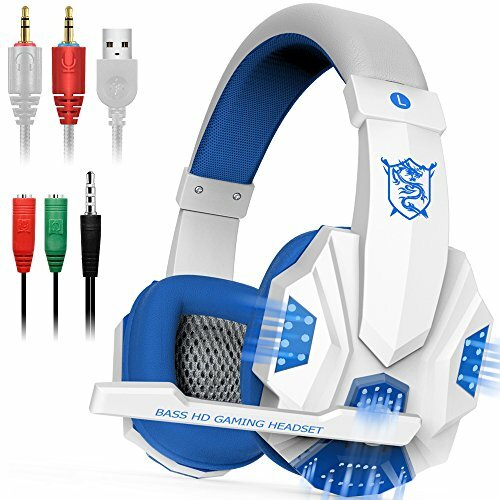 HIGH SOUND QUALITY AND STRONG NOISE ISOLATION: This gaming headset is professional design which gives you an experience of an immersive 360-degree stereo sound, more clear and more strong rhythm while playing games. COMFORTABLE DESIGN: Ear cushions of soft sport PU leather and large size give you a noise isolation environment. Lightweight design is more comfortable for long time wear. 130°MICROPHONE RETRACTABLE: The 130° mic retractable which can give you a more comfortable experience during the games. WIDE APPLICATION: This gaming headset with 3.5mm connector is suitable forPC, laptop. And with an extra adapter cable in package, it can also be applied onPS4, Xbox One, PSP, iPhone 6/6 Plus, Samsung S5, S4, LG, Xiaomi, iPad, tablet, etc. EASY AND CONVENIEN TO USE: This headset is NOT USB-Headset, The USB interface is only used for power supply to LED light. No driver needed, Plug and play.Exquisite craftsmanship and fashion appearance. With an additional 1 to 2 3.5mm jack cable. If you have any questions about this product by DLAND, contact us by completing and submitting the form below. If you are looking for a specif part number, please include it with your message.